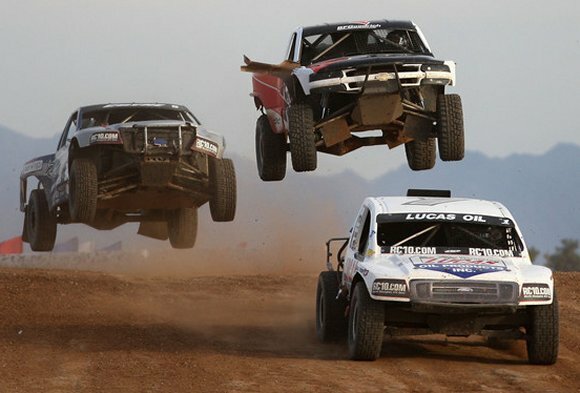 The inaugural season of the Lucas Oil Off Road Racing Series thundered full steam ahead as thousands braved triple digit heat and witnessed some of the most spectacular racing of the season as the short course off road racing season reaches the midway point. As the Lake Elsinore Motorsports Park emerged as a premier venue in short course off road racing, racers and fans alike were treated to incredible action both on and off the track. Lake Elsinore, a city long known for motocross action, skydiving and water sports, has taken their philosophy of Dream Extreme to new heights by embracing the sport of short course off road racing. Amidst a pit party featuring the high profile Hart&Hauntington/Rockstar Premier Motorsports Group, The Metal Mulisha and rock bands Alien Ant Farm and MXPX, the true stars of the weekend were the men who put on an amazing show on the track. And what a track it is! A nine tenths of a mile rutted minefield featuring sweeping turns and seemingly endless high flying table tops proved to be as challenging as it was technical. Starting in practice on Friday as Leroy Loerwald and Kyle LeDuc found themselves out of the Unlimited Lite weekend racing action with broken bones (Loerwald) and destroyed vehicles (LeDuc), the drivers and teams immediately took notice that this facility was going to require their “A” game. Racing action was nothing short of compelling. Coming into the weekend Rob Naughton held the distinction of being the only undefeated driver in this short course off road racing season while dominating the Unlimited Lite class. Class Veterans Marty Hart, Kyle LeDuc and Rodrigo Ampudia all arrived at Lake Elsinore to line up against Naughton with recent up and comers such as Chris Brandt to take their stab at unseating the seemingly invincible Naughton. But on Saturday, the Metal Mulisha’s Brian Deegan, now in his sophomore season, emerged victorious laying claim as this season’s giant killer while establishing himself as a contender in what is arguably the most competitive class in the sport. Naughton, now having tasted defeat, returned Sunday to take the checkered flag while continuing his drive for a season championship. As two wheel stars continue to develop into contenders in the short course off road racing arena, Multi-Time Motocross and SuperMoto Champion Jeff Ward piloted his Bully Dog/Speed Technologies Unlimited 2 to his first victory. Still in his rookie season, “Wardy” was the class of the field on a Sunday that saw the Unlimited 2 class leader Jerry Whelchel the victim of a violent crash. Ironically, Whelchel’s incident occurred in the exact same spot while approaching turn one where the always aggressive Papas and Beer’s Rodrigo Ampudia stunned the crowd as his truck crashed and flew end over end repeatedly the prior day. While fans saw some new faces and names at the top spot on the podium, Lucas Oil’s Carl Renezeder, while competing in both Unlimited 2 and Unlimited 4 classes found himself taking three wins in four races during the weekend event. Renezeder, while proving dominant in his U-4 machine, found a unique passing method. While continuously being able to carry momentum through the back table top section, from the grandstands the high flying Renezeder appeared to reel in his competition with his truck by literally flying by them over the huge table top sections. Sunday proved to be Renezeder’s biggest challenge as Kent Brasho, Jerry Daugherty and Tim Herbst all challenged for the lead before Renezeder again proved to be too strong. With record high temperatures keeping the crowd seeking shade throughout the day, the action on the track kept them on their feet cheering for their heroes. Lake Elsinore truly did “Dream Extreme” as the Lucas Oil Off Road Racing Series continues to establishes new stars, impressive new venues and carries the momentum of the sport of short course off road racing forward.